After four hours of driving through the interior of British Columbia we arrived at our destination: the Ymir Motel, in the forgotten gold mining town of the same name. This place is the staging area for most trips into the Ymir backcountry–and, it’s cheap, $12 per person per night cheap–by sharing rooms. Turns out the owner of the hotel is an art collector and purchased the 18 room hotel for his prized possessions, thousands of painting of all styles, covering every wall. Imagine a museum crossed with a nineteenth century brothel. We slept well under the smug smell of oil paint while dreams of pillow lines ran through our heads. Back in November a group of us decided to plan a trip to a backcountry cabin or yurt in Canada. 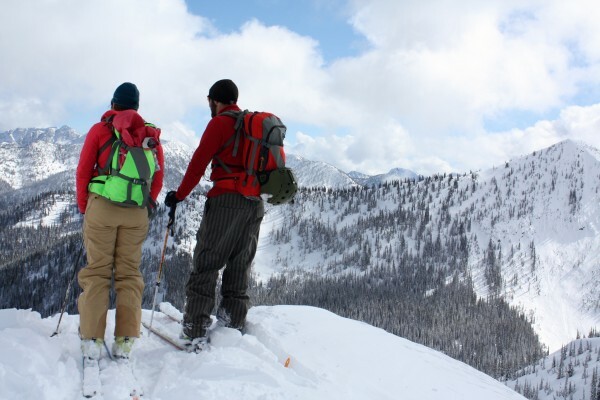 The beauty of the Ymir Yurts is its blend of cat skiing and your more standard backcountry self propulsion. The terrain and deep access was hard to beat. 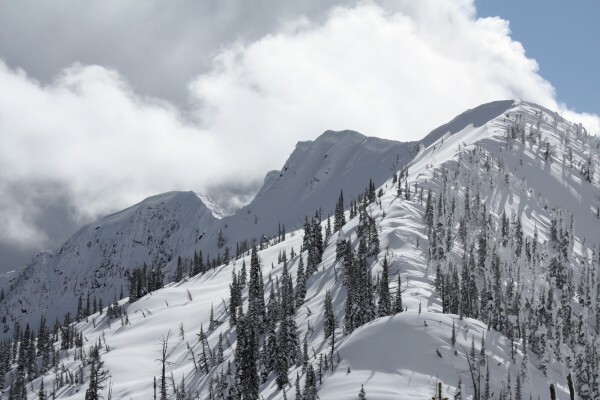 Using both snowmobiles and a snowcat, you’re dropped roughly 32 K from the nearest road. Overnight the area had received much more snow than predicted–about two feet, and the next morning it was still nuking. One of the snowcat guides wore a grin, now knowing that this below average season had just received a little extension. This grin was opposite to the expression that Trevor, the owner of the whole operation and a mountain guide, wore–and rightfully so. We dug a pit and discovered that the sun crust and surface hoar from the dry weather from previous weeks was now a perfect sliding layer, transforming the snow pack from weak to very weak. Carefully, we skied some great trees, meeting the cat again at a clear cut. Killer turns on killer snow. Because conditions were extreme Trevor opted to skin with us to the pass that accesses the yurt. Usually parties are left at the bottom of the pass to fend for themselves. While ascending the slope to the saddle we remotely triggered 3 slabs, one of which ran about 800 feet. Skiing big lines was out of the question. One at a time we gingerly skied down the other side of the saddle to the yurt. The yurt is best described as a two story marvel of Canadian ingenuity. Dave remembering that he needs to breathe. The next day we ventured to the saddle again, gaining vertical using a low angle approach. Overnight another foot of snow had fallen. As we ascended, the snowpack settled 6 inches in a 20 foot circle of which Dave was the center. He was skinning only 20 feet in front of me. The whumping air beneath the snow almost blew my sunglasses off. After that Dave and I switched breaking trail. Soon after I crested the ridge, I heard a large whump, and felt some settling beneath me. Dave crested the ridge just behind me and got a view of the cross loaded side. That whump I’d heard was the start of yet another slide that cut 300 feet across the slope just under the ridge and ran 1000 . By the end of the day the 6 slides we’d remotely triggered beat the number of laps we’d made by one. Despite the high avy conditions, the tree skiing was ridiculously good. The dps Wailer skis I brought on the trip just killed it: super floaty, buttery smooth, playful and light even at full speed. Everyone was jealous. We’d been eyeing the South facing slope behind the yurt since our arrival. We’d watched it for a few days; it looked consistent and safe, so on Sunday, under splitter blue skies, we set a skin track to check conditions. The slope’s angle just touched 30 degrees at some rollovers, and was heavily treed, so we pushed on. The sun-softened snow skied so well- so creamy- so delish. Despite the big lines lurking across the cirque we were content, knowing that even a rogue rabbit could trigger a slide in these conditions. 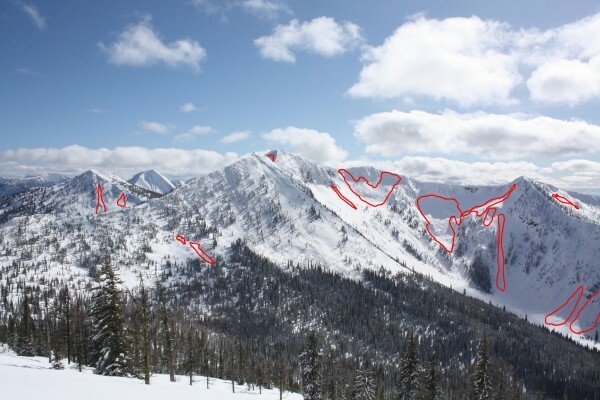 Looking towards Qua Peak: all the visible slides are outlined in red. Exiting on the final day had made us all nervous. Every time we had even gone near a slope something slid. One at a time we descended, and for the first time nothing on or near the slope moved. We then skied the clear cut and met the snowmobiles for an express ride out. Some of the group, myself included, spun a couple laps through the clear cut while we waited. Blower over the head! Lots of windblown features to play around, which made the kind of snow that you dream of–or at least I do. Soon the guides arrived and picked up our packs, we skinned the last steep hill, then skied down to the cat to ride out the rest of our 32K exit. What a trip. Back on the road. Back to the States. Whitefish, Montana. A much needed rest day. One day at Whitefish Mountain on scary icy, thin, terrible conditions, made the best of it by killing some corduroy. The next day after a late start (thanks to some St. Patrick’s day car bombs), I somehow convinced Dave to go up to go for a tour. 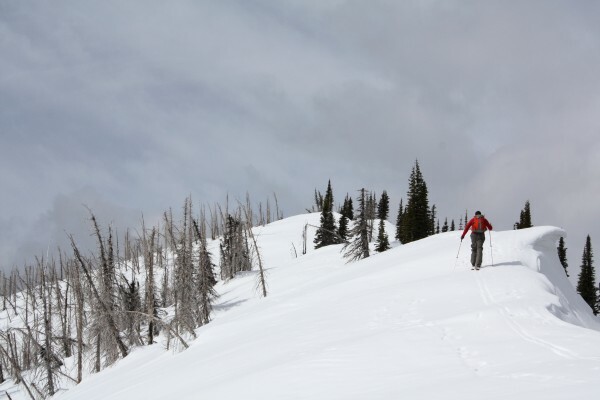 Like most tours in Montana, Jewel Basin would have been a quick jaunt with a snowmobile, but we were only human powered. 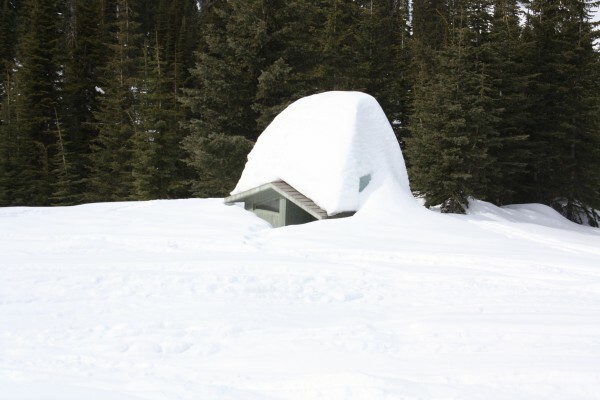 Plenty of snow in the Jewel Basin parking lot -- yes, that is the outhouse. A four mile approach led to some great views of the Flathead Valley, and about 20 good turns on the North facing slope. The final decent was about as painful as it gets. An icy road with three-miles of what I can only call death bumps. All I could dream of was luscious powder from the days before–and yes, it got me through the ride home. Conditions that both Kyle and myself have encountered this season certainly cause one to reflect more on safety and risk aspects of doing the things we love in the mountains. Snow sense, experience, and knowledge are the best weapon against getting caught in a slide. I wear a beacon and always will, but it’s no magic bullet, and I think we sometimes forget that. Once completely buried, statistics show that beacons hardly decrease mortality rates. Little data’s been collected in real life tests for Avalungs, but I suspect these devices will statistically show a significant reduction in mortality. 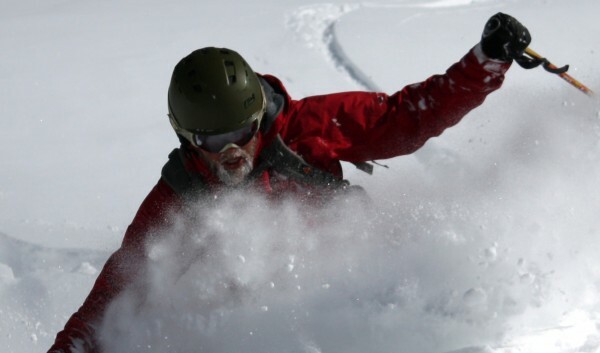 The hardest equipment data out there, and what seems to make the most difference in avalanche mortality rates, is deploying an air-bag. These devices have hit main stream in Europe and Canada, but have yet to develop a foothold in the United States. I’m hoping this shifts soon. Using one of these systems wouldn’t change my decision making, but it would give me peace of mind knowing that if I do get caught in a slide survival is more likely.